Wadi Qelt (Arabic: وادي القلط‎‎; also: Wadi al-Qult, Wadi el-Qult, Wadi Kelt, Wadi Qilt or Wadi Qult), also Nahal Prat (Hebrew: נחל פרת‎), formerly Naḥal Faran (Pharan brook), is a valley, riverine gulch or stream (Arabic: وادي‎‎ wādī, "wadi"; Hebrew: נחל‎‎, "nahal") in the West Bank, originating near Jerusalem and running into the Jordan River near Jericho and the Dead Sea. Wadi Qelt is home to a unique variety of flora and fauna. St. George's Monastery and the royal winter palace complex built by the Hasmoneans and Herod the Great are located in the Wadi, which has been identified with the biblical Perath mentioned in Jeremiah 13:5. During the First Jewish war with Rome, insurgent leader Simon bar Giora is said to have held out in caves in this valley, known formerly as the Pharan brook. Wadi Qelt contains monasteries and old Christian locations. Several aqueducts have been found along the stream, the oldest dating to the Hasmonean period (2nd century BC). The aqueducts transported water from three main springs in the valley to Jericho. It was home to the winter palaces of Hasmonean kings and Herod the Great. The Wadi Qelt Synagogue, built as part of the Hasmonean royal winter palace, is believed to be one of the oldest synagogues in the world. Qubur Bani Isra'in are very large Bronze-Age stone structures, which rise from a rocky plateau overlooking Wadi Qelt. 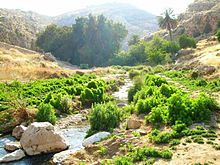 According to tradition, the first monastic settlement of the Judaean desert was established by St Chariton the Confessor towards the end of the 3rd century in upper Wadi Qelt, an area known to the Greek Orthodox as Pharan Valley. The Monastery of Saint George was founded by John of Thebes around 480 AD, and it became an important spiritual centre in the sixth century under Saint George of Choziba. Hermits living in caves in nearby cliffs would meet in the monastery for a weekly mass and communal meal. The area was occupied by Israel in 1967. On December 20, 1968, Israeli lieutenant-Colonel Zvi (Tzvika) Ofer, commander of the elite Haruv unit, former Military Governor of Nablus and recipient of the Israeli medal of valour, was killed in action in Wadi Qelt while pursuing Arab militants who had crossed the Jordan. Israel declared parts of the wadi as a protected area under the name Ein Prat Nature Reserve. Much of Wadi Qelt is a popular route for Palestinian and Israeli hikers. It is possible to hike all the way from the town of Hizma to Jericho, a journey of 25 kilometres and an 850m descent. Israeli, Palestinian and foreign hikers use the partially marked paths along the wadi. Palestinians are generally able to visit when coming from Nablus, Ramallah and Jerusalem without having to pass through checkpoints. The wadi is used by many Bedouin shepherds. Some Bedouin and residents of Jericho are also earning their livelihood near the Monastery of St George, by offering donkey rides to pilgrims and selling them beverages and souvenirs. ^ Samuel Klein, The Twenty-four City Councils in Judea (ארבע ועשרים בולאות שביהודה), Vienna 1933, p. 293 (in memory of R. Zvi Peretz Chayot), where he cites Schick and Nestle in Zeitschrift des deutschen Palästina-Vereins (ZDPV – Journal of the German Society for Exploration of Palestine), 1911, pp. 103–ff. Cf. Josephus (Wars 4.9.4). ^ "En Prat Nature Reserve". allaboutjerusalem.com. ^ Gruber, Angela (3 April 2015). "In the occupied West Bank, even hiking is political". +972 mag. Retrieved 2 March 2016. ^ "Jericho - The Winter Palace of King Herod - Jewish Virtual Library". jewishvirtuallibrary.org. ^ "The Tombs of the Children of Israel". goisrael.com. ^ Teveth, Shabtai (1969/1970) The Cursed Blessing. The story of Israel's occupation of the West Bank. Weidenfeld & Nicolson. SBN 297 00150 7. Translated from Hebrew by Myra Bank. Page 347. ^ Szepesi, Stefan (2012). Walking Palestine: 25 Journeys Into The West Bank. Oxford: Signal. p. 201. ISBN 978-1-908493-61-3. Wikimedia Commons has media related to Wadi Qelt.